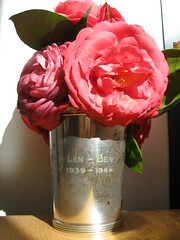 We were expecting another freeze tonight so I thought I'd clip some camellias, lest they get zapped in the freeze. Thankfully, the freeze didn't end up damaging any plants in my yard. 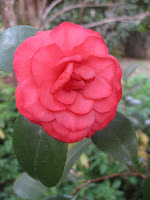 My camellias aren't show quality -- some are a little raggedy on the edges -- but I still enjoy them. I figure they look pretty good considering that I really don't do anything to take care of the bushes, just a little pruning every now and then. I've never been big on fertilizing, even though from a biology standpoint I know that plants need certain nutrients to thrive. Part of me was worried about not knowing how much to apply and contributing to groundwater pollution, i.e. how to fertilize appropriately. I'm thinking about using some controlled-release fertilizer that's good for acid-loving plants. The plants would probably appreciate it. As long as I choose a controlled-release formula and apply the right amount, I shouldn't be causing any excess leaching of the fertilizer into the groundwater. A co-worker saw the camellias on my desk and suggested I try air layering to produce more plants. It would be cool to have new camellia plants to share with my gardening friends, but I'm not sure I've got the stamina for the air-layering process. Brrr! It's supposed to get down to 27 degrees tonight here in Gainesville and I just got in from dragging my plants into the warmth of my laundry room, aka the plant spa. The tender in-ground plants got swaddled in blankets and tucked in for a cold winter's nap. The key is to make sure that the blankets go down to the ground so that they trap the residual ground heat. I'll leave the blankets on through the day tomorrow because we're expecting more freezing temperatures tomorrow night. I'm also trying something new tonight -- propping up the blankets with a broom -- because the last time I covered the crinums I snapped a few leaves. This isn't related to gardening, but it is related to blogging. I kill plants. Not intentionally, of course, but it is true. As much as I love plants, I'm not always the best at taking care of them. I call it the tough-love approach -- I give them water for the first month or so, then they're on your own. My greatest horticultural sin is buying plants and then never putting them in the ground, leaving them in their pots to wither away and die (my deepest condolences go out to the perennial peanut I killed in this manner last fall). There. I've said it. I like baseball. Some people say it's boring, but I love the tradition of it. I've been a Braves fan since I was 8. I also like country music. Most people find this surprising, but I've been a fan of country music since high school. I can definitely tap my toe to mainstream, contemporary country, but I get much more excited about old-school country (including Johnny Cash, George Jones, Patsy Cline, Loretta Lynn, and Wanda Jackson) and alt-country (Son Volt, Whiskeytown, The Jayhawks, Emmylou Harris, Lucinda Williams and Neko Case). 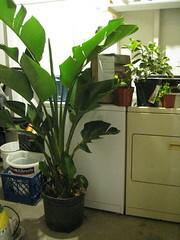 My favorite color is green, which is perhaps not surprising for someone who professes to love plants. I lead a secret life as the sassy crafter, saving the world one project at a time by transforming old cast-offs into fun, new creations. I once made my sister throw her Barbie shoe out the car window on a cross-country road trip. I'm still trying to live down my title of World's Meanest Older Sister. I have a weakness for shiny things. Back when I was a full-on vegetarian, I once ate a plate of venison. I was in college at the time, and my best friend's dad sent her the backstrap cut from the first deer he shot that fall. I figured he'd gone to all the trouble to kill the deer, clean it, and ship the tastiest cut all the way from Oregon to Massachusetts, so there was no way I could refuse a taste. A taste? It was so good I ate the whole plate! My middle name is a common food item. I used to race mountain bikes and was once a Florida State Champion. 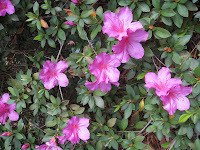 So now I'm tagging a few other bloggers whose blogs I enjoy reading: Florida EcoMania, Garden Living, Gardening in Central Florida, Bella Dia, betz white, gonzomama knits, Craftside, and MissMalaprop.com. 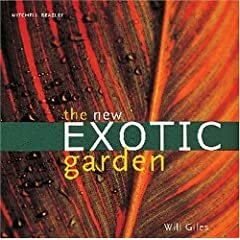 Okay, so this has little to do with creating a tropical-look garden, but I felt compelled to post this here. Most of us in the office have been suffering recently with snuffly noses, sore throats and congested sinuses. I had seen online that the pine pollen counts were high and now I have visual confirmation. 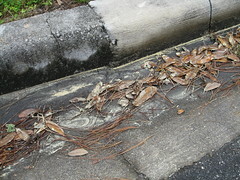 Apparently it rained a little bit last night and washed the pollen into the gutter, leaving a pollen high-water mark. That's a lot of pollen! 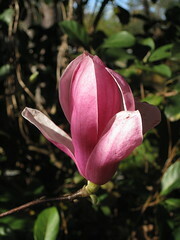 The Magnolia soulangiana in my yard started blooming last week. 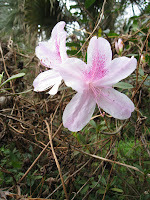 It's typically the first thing in my yard to flower, followed by the camellias and azaleas. I'll see if I can't get some shots of them soon. I've also seen a few redbuds beginning to open around town. Apparently, spring is here. Okay, I captured a few more shots before work this morning. The first four were taken in my yard. 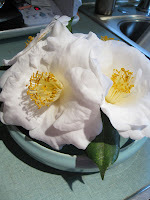 Well, the white camellias were in the kitchen, but they were growing in the yard before I snipped them and made the into a bouquet. 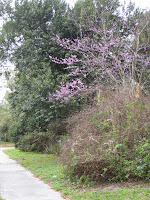 The picture of the redbud tree is from a yard I drive by on my way to work.